Lysinibacillus sphaericus strain OT4b.31 is a native Colombian strain having no larvicidal activity against Culex quinquefasciatus and is widely applied in the bioremediation of heavy-metal polluted environments. Strain OT4b.31 was placed between DNA homology groups III and IV. By gap-filling and alignment steps, we propose a 4,096,672 bp chromosomal scaffold. The whole genome (consisting of 4,856,302 bp long, 94 contigs and 4,846 predicted protein-coding sequences) revealed differences in comparison to the L. sphaericus C3-41 genome, such as syntenial relationships, prophages and putative mosquitocidal toxins. Sphaericolysin B354, the coleopteran toxin Sip1A and heavy metal resistance clusters from nik, ars, czc, cop, chr, czr and cad operons were identified. Lysinibacillus sphaericus OT4b.31 has applications not only in bioremediation efforts, but also in the biological control of agricultural pests. Biological control of vector-borne diseases, such as dengue and malaria, and agricultural pests have been an issue of special concern in the recent years. Since Kellen et al. first described Lysinibacillus sphaericus as an insect pathogen, studies have shown mosquitoes to be the major target of this bacterium [2-4], but toxic activity against other species has also been reported [5,6]. L. sphaericus larvicidal toxicity has been reported due to vegetative mosquitocidal toxins (Mtx) , the binary toxin (BinA/BinB) , Cry48/Cry49 toxin  and recently the S-layer protein . To date, no larvicidal activity has been identified in Lysinibacillus sphaericus OT4b.31 against Culex quinquefasciatus . On the other hand, Lysinibacillus species are potential candidates for heavy metal bioremediation. Some Bacillaceae strains have been successfully isolated from nickel contaminated soil , industrial landfills , naturally metalliferous soils  and a uranium-mining waste pile . In addition, native Colombian Lysinibacillus strains have been reported as potential metal bioremediators. Strain CBAM5 is resistant to arsenic, up to 200 mM, and contains the arsenate reductase gene . L. sphaericus OT4b.31 showed heavy metal biosorption in living and dead biomass. The S-layer protein was also shown to be present . We observed 19 mosquito-pathogenic L. sphaericus strains and 6 non-pathogenic strains (including OT4b.31) that were able to grow in arsenate, hexavalent chromium and/or lead . The moderate heavy metal tolerance in a Lysinibacillus strain isolated from a non-polluted environment generates interest in characterizing the genomic properties of L. sphaericus OT4b.31, in addition to its biotechnological potential in biological control. Here we present a summary classification and a set of features for Lysinibacillus sphaericus OT4b.31 including previously unreported aspects of its phenotype, together with the description of the complete genomic sequencing and annotation. Formerly known as Bacillus sphaericus, the species was defined as having a spherical terminal spore and by its inability to ferment sugars . According to physiological and phylogenetic analysis, it was reassigned to the genus Lysinibacillus . Strains of L. sphaericus can be divided into five DNA homology groups (I–V). Some mosquito pathogenic strains are allocated in subgroup II-A, while Lysinibacillus fusiformis species is in subgroup II-B . Later, according to 16S rDNA and lipid profile comparisons, Lysinibacillus sphaericus sensu lato was classified into seven similarity subgroups, of which only four retained the previous description by Krych et al. . Recently, by using 16S rDNA phylogenetic analysis some mosquito pathogenic native strains were found in group II with heterogeneous heavy metal tolerance levels. . Partial 16S rRNA gene sequences (1,421 bp) were aligned to establish the phylogenetic neighborhood of Lysinibacillus sphaericus OT4b.31 (Figure 1). The phylogenetic tree was constructed by neighbor-joining  using the SEAVIEW  and TreeGraph2  packages. Genetic distances were estimated by using the Jukes-Cantor model . The stability of relationships was assessed by bootstrap analysis based on 1,000 resamplings for the tree topology. Interestingly, L. sphaericus OT4b.31 did not fall into any existing DNA similarity group; it was found between DNA similarity groups III and IV . Consistent with Lozano & Dussán , L. sphaericus OT4b.31 did not fall into DNA similarity groups I, II or III. Phylogenetic tree highlighting the position of Lysinibacillus sphaericus OT4b.31 relative to the available type strains and other non-assigned species within the families Alicyclobacillaceae and Bacillaceae. Alicyclobacillus cycloheptanicus was designated as the outgroup species for the analyses. Right brackets encompass each homology group (I–VII) according to Nakamura’s benchmarks . Nucleotide sequences obtained from GenBank and used in the phylogenetic analyses were as follows: Alicyclobacillus cycloheptanicus 1457 (X51928), Geobacillus stearothermophilus 10 (X57309), Bacillus subtilis 168T (X60646), Bacillus licheniformis DSM 13T (X68416), Bacillus megaterium IAM 13418T (D16273), Bacillus sp. BD-87 (AF169520), Bacillus sp. BD-99 (AF169525), Bacillus sp. NRS-1691 (AF169531), Bacillus sp. NRS-1693 (AF169533), Solibacillus silvestris StLB046 (NR_074954), Lysinibacillus massiliensis 4400831 (NR_043092), Bacillus sp. NRS-250 (AF169536), Bacillus sp. B-1876 (AF169494), Bacillus sp. NRS-1198 (AF169528), Bacillus sp. B-4297 (AF169507), Bacillus sp. NRS-111 (AF169526), Lysinibacillus sphaericus OT4b.31 (AQPX00000042.1:91-1546), Bacillus sp. B-183 (AF169493), Lysinibacillus sphaericus B-23268T (AF169495), Lysinibacillus sphaericus JG-A12 (AM292655), Bacillus sp. B-14905 (AF169491), Lysinibacillus sphaericus ZC1 (NZ_ADJR01000054.1:1-1487), Lysinibacillus sphaericus C3-41 (NC_010382.1:16887-18287), Bacillus sp. B-14865 (AF169490), Lysinibacillus sphaericus 2362 (L14011), Lysinibacillus fusiformis ATCC-7055 (AJ310083), Bacillus sp. B-14957 (AF169492) and Bacillus sp. B-23269 (AF169496). The branches are scaled in terms of the expected number of substitutions per site. Numbers adjacent to the branches represent percentage bootstrap values based on 1,000 replicates. Lineages with type strain genome sequencing projects registered in GOLD  are labeled with one asterisk, those also listed as 'Complete and Published' with two asterisks. Dussán et al. evaluated physiological diversity and genetic potential in native Bacillaceae isolates from highlands of the Colombian Andes, where Lysinibacillus sphaericus OT4b.31 was first described (Table 1). L. sphaericus OT4b.31 is an aerobic free-living bacterium isolated from coleopteran (beetle) larvae collected in the highlands of the Colombian Andes . Vegetative cells stain Gram positive, but in sporulating stages, cell stain Gram variable (Figure 2). By using a JEOL JSM-5800LV (Japan) scanning electron microscope, L. sphaericus OT4b.31 is estimated to measure 0.61 to 0.65 µm in width and 1.9 to 2.3 µm long (Figure 3). L. sphaericus OT4b.31 showed slow sporulation rates (undetectable up to 40 hours of growth) and positive evidence of binary toxin which does not exhibit larvicidal activity against Culex quinquefasciatus . Cultures grow at 10 to 40°C over a pH range of 6.0 to 9.0. Antibiotic resistance was evaluated separately by adding filter sterilized antibiotic solutions in Luria-Bertani broths and checking turbidity after 15 hours of growth. L. sphaericus OT4b.31 is sensitive to kanamycin (12.5 µg/mL), chloramphenicol (25 µg/mL), erythromycin (5 µg/mL), and gentamicin (25 µg/mL), while it showed resistance to trimethoprim/sulfamethoxazol up to 30 µg/mL/150 µg/mL. Gram staining of (A) vegetative cells and (B) spores of Lysinibacillus sphaericus OT4b.31. 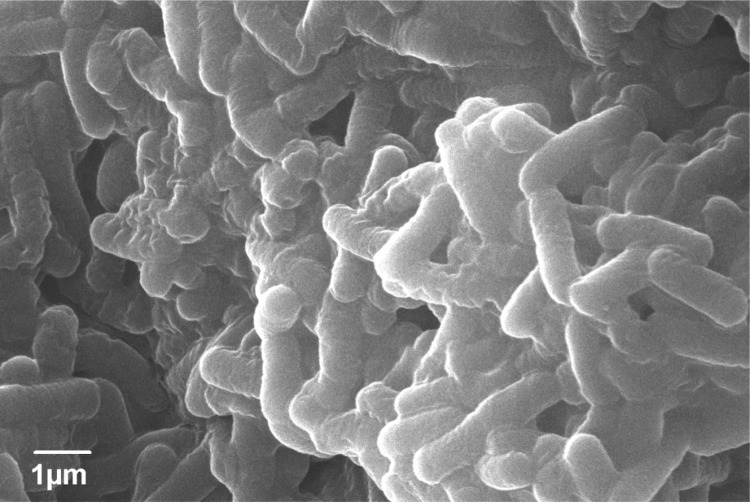 Scanning electron micrograph of Lysinibacillus sphaericus OT4b.31 at an operating voltage of 20 kV. The genome sequencing of Lysinibacillus sphaericus OT4b.31 was supported by the CIMIC (Centro de Investigaciones Microbiológicas) laboratory at the University of Los Andes within the Grant (1204-452-21129) of the Instituto Colombiano para el fomento de la Investigación Francisco José de Caldas. Whole genomic DNA extraction and bioinformatics analysis was performed at CIMIC laboratory, whereas libraries construction and whole shotgun sequencing at the Beijing Genome Institute (BGI) Americas Laboratory (Tai Po, Hong Kong). The applied pipeline included quality check of reads, de novo assembly, a gap-filling step and mapping against a reference genome. This whole genome shotgun project has been deposited at DDBJ/EMBL/GenBank under the accession AQPX00000000. The version described in this paper is the first version, AQPX01000000. A summary of the project information is shown in Table 2. Lysinibacillus sphaericus strain OT4b.31 was grown in nutrient broth for 16 hours at 30ºC and 150 rev/min. High molecular weight DNA was isolated using the EasyDNA® Kit (Carlsbad, CA, USA. Invitrogen) as indicated by the manufacturer. DNA purity and concentration were determined in a NanoDrop spectrophotometer (Wilmington, DE, USA. Thermo Scientific). After DNA extraction, samples were sent to the Beijing Genome Institute (BGI) Americas Laboratory (Tai Po, Hong Kong). Purified DNA sample was first sheared into smaller fragments with a desired size by a Covaris E210 ultrasonicator. Then the overhangs resulting from fragmentation were converted into blunt ends by using T4 DNA polymerase, Klenow Fragment and T4 polynucleotide kinase. After adding an “A” base to the 3' end of the blunt phosphorylated DNA fragments, adapters were ligated to the ends of the DNA fragments. The desired fragments were purified though gel-electrophoresis, then selectively enriched and amplified by PCR. The index tag was introduced into the adapter at the PCR stage as appropriate, and a library quality test was performed. Lastly, qualified, short, paired-ends of 90:90 bp length with 500 bp insert libraries were used to cluster preparation and to conduct whole-shotgun sequencing in Illumina Hi-Seq 2000 sequencers. Using the FASTX-Toolkit version 0.6.1  and clean_reads version 0.2.3 from the ngs_backbone pipeline  reads were trimmed and quality filtered. Then, with the CLC Assembly Cell version 4.0.10 , assembly and scaffolding steps were conducted via a de novo assembly pipeline. The assembly included automatic scaﬀolding and k-mer/overlapping optimization steps. Some gaps were successfully filled by using GapFiller  within 30 iterations. No more gaps reached convergence by running more iterations. To obtain structural insight of a chromosomal scaffold, we used CONTIGuator.2 , using the Lysinibacillus sphaericus strain C3-41 chromosome (accession number: CP000817.1) as reference. Gap-filling steps and mapping to reference sequences were performed again to confirm convergence. Quality assessment of the assembly was performed with iCORN . The error rate of the final assembly is less than 1 in 1,000,000. Lastly, by using PROmer from the MUMmer  and Mauve  packages, we compared the chromosomal assembly and the chromosome of L. sphaericus C3-41. The Glimmer 3 gene finder was used to identify and extract sequences for potential coding regions. To achieve the functional annotation steps, the RAST server  and Blast2GO pipelines  were used. Blast2GO performed the blasting, GO-mapping and annotation steps; which included a description according to the ProDom, FingerPRINTScan, PIR-PSD, Pfam, TIRGfam, PROSITE, ProDom, SMART, SuperFamily, Pattern, Gene3D, PANTHER, SignalIP and TM-HMM databases. The results were summarized with InterPro . Additionally, a GO-EnzymeCode mapping step was used to retrieve KEGG pathway-maps. tRNA genes were identified by using tRNAscan-SE  and rRNA genes by using RNAmmer . The possible orthologs of the genome were identified based on the COG database and classified accordingly . Prophage region prediction was also conducted by using the PHAST tool . The genome summary and statistics are provided in Tables 3 and 4 and Figure 4. The genome consists of 96 scaffolds in 4,856,302 bp total size with a GC content of 37.5%. A total of 23 scaffolds were successfully aligned to a reference sequence, comprising 4,096,672 bp of sequence and are represented by the red and blue bars within the outer ring of Figure 4. Of the 4,938 genes predicted, 4,846 were protein-coding genes, 46 RNAs, and 1,623 pseudogenes were identified. Genes assigned a putative function comprised 67.13% of the protein-coding genes while the remaining ones were annotated as hypothetical proteins. The distribution of genes into COGs functional categories is presented in Table 5. 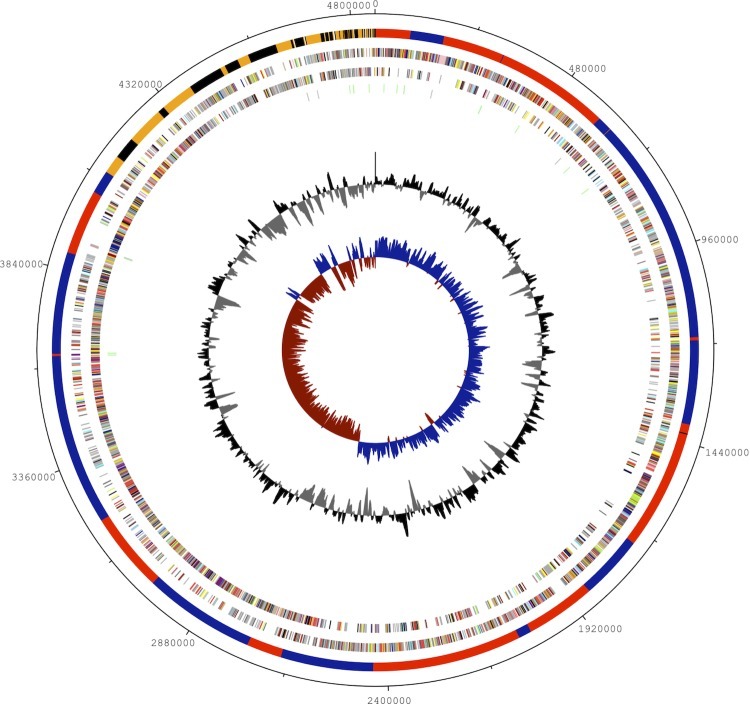 Graphical map of the genome. From outside to the center: Ordered and oriented scaffolds assigned to chromosome in blue and red, extrachromosomal scaffolds in orange and black, Genes on forward strand (color by COG categories), Genes on reverse strand (color by COG categories), RNA genes (tRNAs green, rRNAs gray), GC content and GC skew. To complete the assembly process, a resequencing pipeline was applied that set whole genome sequences as references such as Lysinibacillus sphaericus C3-41, Bacillus sp. strain B-14905, Bacillus sp. NRRL B-14911, Bacillus megaterium QM B1551, Bacillus anthracis Ames, Lysinibacillus boronitolerans F1182 and Lysinibacillus fusiformis ZC1. Mapping coverage was lower than 30% in any case (data not shown). In addition, GC content, and depth–GC correlation analysis demonstrated neither a biased distribution nor heterogeneity in the GC content of raw data. Thus, a de novo assembly was conducted in the CLC Assembly Cell version 4.0.10, as discussed above, resulting in a 123-scaffold assembly with a N50=96,816 bp. After the gap-filling step, all intrascaffold gaps and 29 interscaffold gaps were closed, leaving 94 scaffolds with a N50=205,086 bp. Finally, a mapping step was conducted using the sequences mentioned above as references. This yielded 26 supercontigs that mapped to L. sphaericus strain C3-41 chromosome corresponding to 88.9% of the reference chromosome. This alignment was proposed as a chromosomal scaffold. Other reference sequences lead to no significant coverage levels and extrachromosomal scaffolds did not align to previously sequenced plasmids of related species (data not shown). Chromosomal comparison from the PROmer analysis between L. sphaericus strains OT4b.31 and C3-41 showed that most of the two chromosomes mapped onto each other, revealing large segments of high similarity (Figure 5). 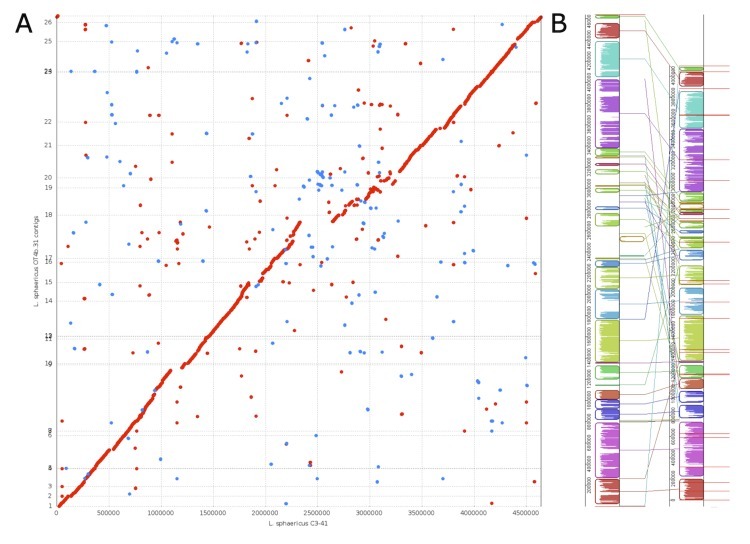 However, a region comprising around 2 to 3.25 Mbp in the C3-41 chromosome and the contigs 15 to 19 in the chromosomal scaffold were remarkably scattered in the dot-plot, revealing low coverage levels and different syntenial relationships to the reference sequence. (A) Dot-plot of amino-acid-based alignment of a 4.09 Mbp chromosomal scaffold of L. sphaericus OT4b.31 (y-axis) to a 4.6 Mbp chromosome of L. sphaericus C3-41 (x-axis). Aligned segments are represented as dots or lines. Forward matches are plotted in red, reverse matches in blue. Figure generated by PROmer . (B) Nucleotide-based alignment of a 4.09 Mbp chromosomal scaffold of L. sphaericus OT4b.31 (right) to a 4.6 Mbp chromosome of L. sphaericus C3-41 (left). A total of 27 homologous blocks are shown as identically colored regions and linked across the sequences. Regions that are inverted relative to L. sphaericus OT4b.31 are shifted to the right of center axis of the sequence. The origin of replication in each sequence is approximately at coordinate 1. Red bars show the limits of each contig in the chromosomal scaffold. Contigs 1 to 26 are numbered in ascending order start in coordinate 1. The figure was generated by Mauve . 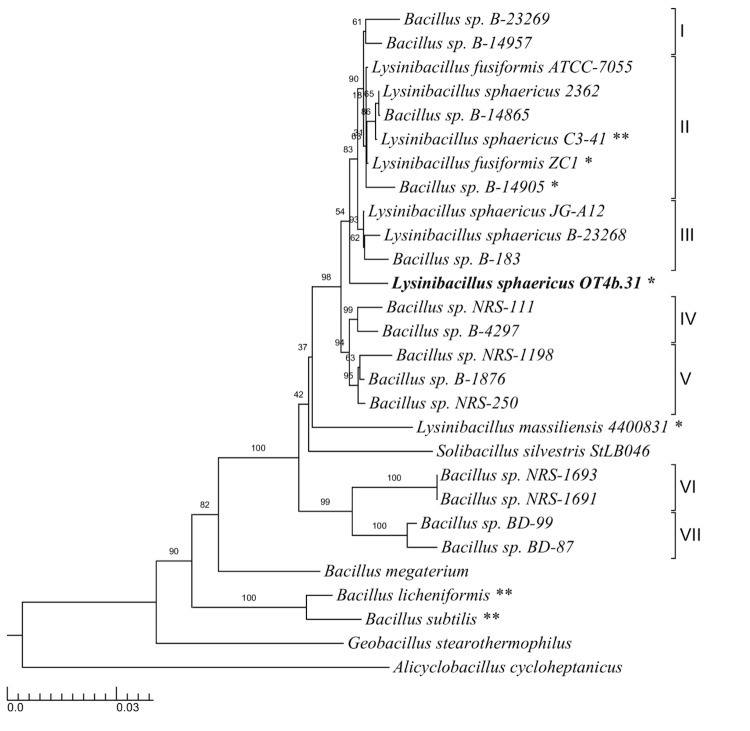 The origin of replication of the chromosome of L. sphaericus OT4b.31 was estimated by similarities to several features of the corresponding regions in L. sphaericus C3-41, Bacillus sp. B-14905 and other close related bacteria, including colocalization of the genes: dnaX, recR, holB, dnaA, recG and recA; and GC nucleotide skew [(G–C)/(G+C)] analysis. In the first 40 Kbp of contig 1, we found dnaX, recR, and holB, while dnaA, recG and recA were found at the end (after 290 Kbp) of contig 13. This may suggest that contig 13 should be allocated immediately before contig 1. Besides, there was no evidence of multiple dnaA boxes around the potential origin. The replication termination site of the chromosomal scaffold is believed to be localized near 2.5 Mbp in the contig 18, according to GC skew analysis, and the coding bias for the two strands of the chromosome is for the majority of CDSs to be on the outer strand from 0 to ~2.5 Mbp and on the inner strand from ~2.5 Mbp to the end of the chromosomal scaffold (contig 26, Figure 4). This was also confirmed by the presence of parC (H131_12178) and parE (H131_12183), which encode the subunits of the chromosome-partitioning enzyme topoisomerase IV . Similar to the L. sphaericus C3-41 genome , we did not find the homolog of rtp (replication terminator protein-encoding gene) in the chromosomal assembly of OT4b.31. A total of 42 hypothetical protein coding sequences were assigned as putative transposable elements, with the most frequent families being IS66, IS110, IS1272 and IS3. In addition, five prophage regions were identified, of which one region is intact and 4 regions are incomplete. Lactobacillus phage C5 (intact), Bacillus phage φ105, Clostridium phage c-st, Bacillus Phage SPP1 and Bacillus phage Wβ predicted regions were allocated at contigs 34, 8, 15, 18 and 37, respectively. Only lysis proteins were predicted in phages C5 and c-st regions. The only genes remaining in the phage φ105 region are those for coat proteins, integrase, and hypothetical and phage-like coding sequences. This is probably the remnant of phage invasion and genome deterioration during evolution. In addition, any previously reported phages in the genome of L. sphaericus C3-41 are in the genome of OT4b.31. Two elements contain conserved domains from the Listeria pathogenicity island LIPI-1, functionally assigned as a thiol-activated cytolysin and a phosphatidylinositol phospholipase C. The first was confirmed to correspond to the L. sphaericus B354 sphaericolysin coding gene in contig 18 (H131_12483). Sphaericolysin B354 has been reported to be widespread across L. sphaericus DNA homology groups not only including IIA, IIB, IV and V  but also non-grouped species such as OT4b.31. Upstream, in the same contig, a Bacillus toxin from the family Mtx2 (PFam PF03318) was found and described as a hypothetical Sip1A toxin coding sequence (H131_12498). Purified from Bacillus thuringiensis strain EG2158, Sip1A is a secreted insecticidal protein of 38 KDa having activity against Colorado Potato beetle (Leptinotarsa decemlineata) . Considering that L. sphaericus OT4b.31 was isolated from beetle larvae, we suggest potential coleopteran larvicidal activity. To our knowledge, strain OT4b.31 is the first report of a predicted Sip1A-like toxin in a native Lysinibacillus sphaericus. Unexpectedly, mtx or bin mosquito pathogenic genes were not found in the OT4b.31 genome, despite a previous report showing positive evidence of BinA/B toxins with no larvicidal activity . A total of 32 CDSs were described as surface (S) layer proteins or S-layer homologs (SLH). The putative S-layer gene sllB (H131_05299) previously reported in L. sphaericus JG-A12  was found in a 3,696 bp sequence allocated in contig 8. Three sequences with conserved domains similar to Slp5 and Slp6 were identified in contigs 8 (H131_05339, H131_05344) and 22 (H131_16838). Bacillus sp. B-14905 was the most similar sequence for the majority of S-layer protein domains. In addition, a putative glycoprotein (H131_22117), a bifunctional periplasmic precursor (H131_05993) and an S-layer fusion (H131_05409) coding sequence associated with S-layer proteins were recognized. On the other hand, a cluster of spore germination genes were determined near the termination of the replication site (including genes from the ger and ype operons) among other genes widespread in the genome. Three clusters of sporulation genes were allocated at contigs 1, 10 and 13 (including genes from spoII, spoV, yaa and sig operons). Responses against toxic metal(oid)s in L. sphaericus OT4b.31 could be controlled by efflux pumps related genes in clusters found in contigs. Putative coding sequence order is as follows: yozA→czcD→csoR→copZA (contig 1, H131_00045: H131_00065); nikABC→oppD→nikD (contig 17, H131_11103:H131_11123); cadC-like→cadA (contig 24, H131_17086:H131_17081); arsRBC – putative extracellular secreted protein CDS – arsR-like→arsR-like→ putative excinuclease CDS (contig 18, H131_11998:H131_12028). The function of YozA is still unknown , but is similar to CzrA and CadC belonging to the ArsR transcriptional family regulators. YozA, CsoR (from the copper-sensitive operon), CadC-like and ArsR proteins seem to be the direct regulators of each cluster. At least one additional copy of ChrA, CzrB and CzcD CDSs were found. Upstream the nik cluster, we could not find transcriptional regulators. In summary, L. sphaericus OT4b.31 has protein encoding sequences probably involved in the resistance against Cd, Zn, Co, Cu, Ni, Cr, and As. In fact, prior reports of resistance to toxic metals [16,17] in L. sphaericus OT4b.31 may be explained due to participation of heavy-metal resistance proteins. Strain OT4b.31 probably has a diverse defense repertoire according to the following responses and predicted genes: bacitracin stress responses, genes bceBASR and yvcPQRS; multidrug resistance, MATE (multidrug and toxin extrusion) family efflux pump genes ydhE/norM and acrB; antibiotics resistance, genes vanRSW, tetP-like group II, fusA (elongation factor G), fosB, blaZ and ampC-like. Based in the KEGG analysis, some predicted proteins might participate in peripheral pathways for the degradation of benzoate, aminobenzoate, quinate, toluene, naphthalene, geraniol, limonene, pinene, chloroalkane, chloroalkene, styrene, ethilbenzene, caprolactam and atrazine compounds, and biosynthesis of streptomycin, novobiocin, zeatin, ansamycins, penicillin and cephalosporins. The native Colombian strain Lysinibacillus sphaericus OT4b.31, isolated from beetle larvae, is classified between DNA similarity groups III and IV. A comparison of the chromosomal sequences of strain OT4b.31 and its closest complete genome sequence, L. sphaericus C3-41, demonstrates the presence of only a few similar regions with syntenial rearrangements, and no prophage or putative mosquitocidal toxins are shared. Sphaericolysin B354 and the coleopteran toxin Sip1A were predicted in the strain OT4b.31, a finding which may be useful not only in bioremediation of polluted environments, but also for biological control of agricultural pests. Finally, Cd, Zn, Co, Cu, Ni, Cr and As resistances probably are supported by efflux pumps genes. We would like to gratefully acknowledge the help of Dr. rer. nat. Diego Riaño-Pachón at Centro Nacional de Pesquisa em Energia e Materiais for his instructions in data analysis and the Group of Computational and Evolutionary Biology at University of Los Andes for providing us access to the computing grid cluster. This work was performed under the auspices of the Grant (1204-452-21129) of the Instituto Colombiano para el fomento de la Investigación Francisco José de Caldas, Colciencias and by the Centro de Investigaciones Microbiológicas - CIMIC laboratory. Baxevanis AD, Ouellette BFF. Bioinformatics: A Practical Guide to the Analysis of Genes and Proteins. John Wiley & Sons; 2004. Garrity GM, Holt J. The Road Map to the Manual. In: Garrity GM, Boone DR, Castenholz RW (eds), Bergey’s Manual of Systematic Bacteriology.Vol 1. Second Edition. New York: Springer; 2001:119–169. Murray RGE. The Higher Taxa, or, a Place for Everything...? In: Holt JG (ed), Bergey’s Manual of Systematic Bacteriology.Vol 1. First Edition. Baltimore: The Williams and Wilkins Co.; 1984:31–34. Ludwig W, Schleifer K, Whitman W. Class I. Bacilli class nov. In: De Vos P, Garrity GM, Jones D, N.R. Krieg W. Ludwig W, Rainey EA, Schleifer KH, Withman WB (eds) Bergey’s Manual of Systematic Bacteriology. In: Vol 3 (The Firmicutes). Second Edition. Dordrecht, Heidelberg, London, New York: Springer; 2009:19–20. Prévot A. Hauduroy P, Ehringer G, Guillot G, Magrou J, Prévot AR, Rosset, Urbain A (eds) Dictionnaire des Bactéries Pathogènes. 2nd ed. Paris: Masson; 1953, p. 1-692. Claus D, Berkeley R. Genus Bacillus Cohn 1872, 174AL. In: Sneath PHA, Mair N, Sharpe M, Holt J, eds. Bergey’s Manual of Systematic Bacteriology.Vol 2. Baltimore: The Williams and Wilkins Co.; 1986:1105–1139.